I watched his highlights on Hudl. He's got a satisfactory arm. He didn't throw many routes outside of a lot of fly routes (Sidebar: We need to be talking to his receivers as well). It looks like he has the strength to throw an out. Where he really stands out is his running ability. He has good moves and speed. He looks like a legitimate dual threat QB. Awesome! Great get! Let's hold on to him! I'm asking around to see what I can find. Nothing on 24/7 is posted. Hmm. I had heard he wanted to wait to announce so I didn't say anything last few days. Good to add another dual threat QB. 247 showing us at 140 offers now, but i'd bet that's well short of the true number. showing 186 now. no idea if that's accurate or not, but i feel like i see several "blessed to receive an offer from texas state university" per day, so we're definitely not shy about extending offers. Larry! Look! Darius has an indoor practice facility. 1) darius is the young man's first name. I'm aware of both. Thanks. I was simply pointing out to Dr. Teis that Darius enjoys the comforts of an indoor facility. SAN MARCOS, Tex. – A little more than a week ago at Bobcat Stadium on the Texas State campus, coaches from across the country came to try and pick out some undiscovered talent at the last Everett Withers Football Camp. Arizona was perhaps the most proactive out-of-state program to offer participants both during and after the event, but several prospects showed that they are names to keep an eye on through the end of the summer and into the fall. A pretty easy argument could be made for Whiting as the top receiver at the event. A couple of other players flashed, but Whiting was consistently impressive and confident running a variety of routes and making tough catches. In the days following the camp, he added an offer from the Wildcats, as well as UNLV, but he said that his recruitment has included both of the major programs in Arizona since the end of spring. In the meantime, Texas Tech has kept up with him since offering him in May and seems to have established a decent foundation with him thus far. He said at the time of the camp Tech and Rice were the only visits he knew for sure were likely stops over the summer for visits. Whiting said that he still hasn’t given much thought about making significant decisions regarding his recruitment, and is waiting to see what else may come down this pipe this summer. After a strong finish to his track season, he has been operating on a bit of a different timeline this offseason than many of the other prospects in the state. South Oak Cliff three-star cornerback Bobby Holmes has had another run of offers come his way this spring, and after an unofficial visit to Indiana earlier this spring, he said the Hoosiers staff is anxious to have him back for an official. At this point of his recruitment, it seems as though Indiana has been the one Power Five team that has been most interested in him, but there are a couple of other teams that have made a positive impression on him in the spring as well. The one that possibly stands out most in that group is Louisiana-Lafayette. Those two teams could lead the race down the stretch for his commitment as he is hoping to be able to make that decision before the fall. Jahari Rogers is has generated plenty of interest since last season on both sides of the ball. 2020 Arlington athlete Jahari Rogers is another up-and-comer that doesn’t look long for waiting on offers to start coming in. Last season, he was dynamic on the offensive side of the ball, but showed at Texas State how tough of a defensive back he could be. With a great frame to play as a physical DB, he was one of the strongest doing so in one-on-ones. After the camp, he said he felt the Wildcats and Bobcats came away the most interested in him. Going back to last fall, he said that two more local Big 12 programs showed significant interest in him, and before the end of the summer, he hopes to further that relationship. He’s certainly placed himself on several programs’ radar, and it seems more a matter of when – not if – someone is going to move on him sooner than later. The prospect that possibly did the most for himself after the camp was Katy-Seven Lakes defensive back John Harrington. The converted quarterback/wide receiver showed his chops on the other side of the ball and left the camp with an offer from Texas State. He came to the event with an offer from Yale in-hand, and he plans to make a visit up there at the end of the month. Since event on June 3, he’s picked up offers from Cornell and UMass, but if he can carry on the level of play that he showed into the fall, the conversation about which offers come through should be much more colorful. Marshall, Texas, slot receiver Tahj Washington was another player that impressed with his quickness and ability to beat defensive backs deep. This past weekend, he picked up his latest offer from Tulane with his performance at a mega-camp in Commerce, Texas. Prior to that, he said that his offers from Kansas and Louisiana-Lafayette had led his recruitment. “I don’t just like them because they’re a Power Five offer, they were enthusiastic when they offered me,” he said of Kansas. “I don’t think that I was on their recruiting board coming in, but they saw my spring tape and was like wow, we have to offer this kid. He also holds offers from Southern Miss, Tulsa and the Bobcats, among others, but he said that the relationship that he’s been building with the Ragin’ Cajuns staff has stood out the most to this point in his recruitment. He said that he is hopeful he’ll be ready to make a commitment between mid- to late-August, so unless something drastic changes with his recruitment, the Cajuns and Jayhawks remain presumptive favorites. One of the more unheralded names in the state is inside linebacker Boomer Irvin, but in a 2019 class that looks a bit short at top-end talent at the position, more opportunities should come his way before the end of the offseason. 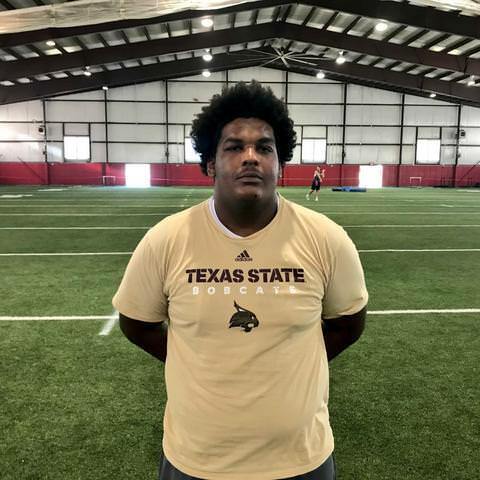 Irvin only holds offers from Air Force and Army to this point, but the impression from the Texas State staff following the camp seemed to be that he was due for a new evaluation. The only non-camp unofficial visit he said that he had taken has been to Houston, but more programs might be interested in hosting him before the end of summer. Last edited by Saul Goodman on Mon Jun 11, 2018 2:51 pm, edited 1 time in total.